Located in the High Atlas Mountains, the Cascades d’Ouzoud provide a bit of relief from the heat of Marrakech. The stunning waterfalls plunge into 110 metres into the canyon in three tiers. The path down to the falls leads to a small pool, popular for an afternoon swim. 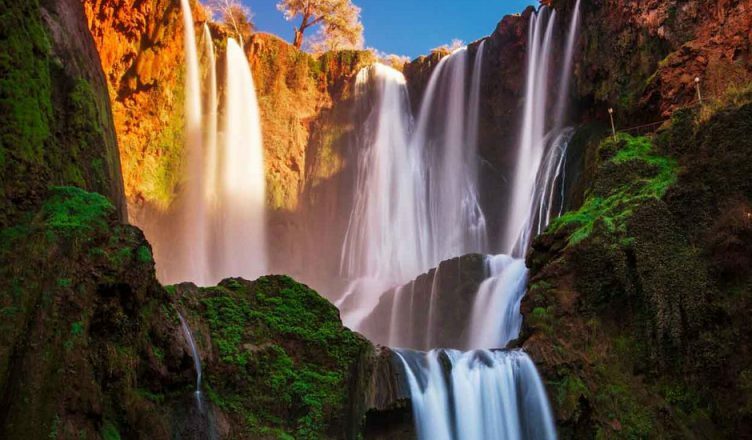 Be mesmerized by the sound of the water while taking in the site of these magnificent waterfalls. We’ll leave Marrakech at 8 a.m.on this day trip to discover the ouzoud and its waterfalls so we stop for breakfast along the way. Before arriving at the Cascades d’Ouzoud, we’ll visit the Berber village of Demnate. We’ll continue and have lunch next to the breath-taking waterfalls. After lunch we drive back to Marrakech.